I spent a week in search of the best restaurants in Victoria BC (not to be confused with the Victoria in Texas, Australia, Malta, Virginia or the Seychelles). To say the city affected me is an understatement. I’ve always thought that if I lived in Canada, Toronto would always be home. I loved growing up in the Maritimes, but it’s too small for me. I adore Montreal, but the winters are brutal. Toronto is the most multicultural and I have loved calling it home for 17 years. Located on the southern tip of Vancouver Island. It reminds me of everything I loved about living by the water in the Maritimes. But it’s just a bit better. 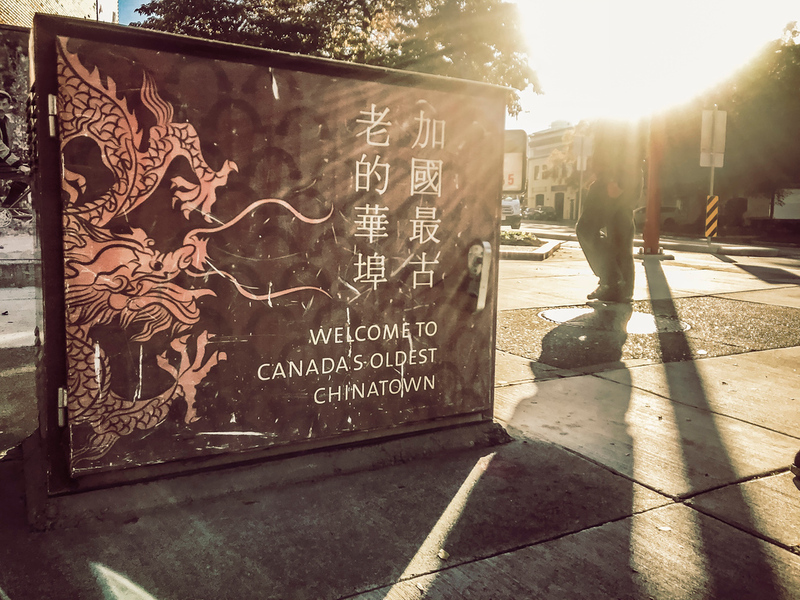 It’s the healthiest city in Canada, the cycling capital (not that I cycle) and has the second most restaurants per capita in North America – second only to San Francisco. And the weather! It has West Coast weather but only half the rainfall of Vancouver. I was warned that Victoria was full of young people and retirees, that it was pretty but boring and sleepy. This was not the case for me. I met inspiring people my age who had also visited and fallen in love with the city. Young entrepreneurs, pursuing their passion with food-related businesses. I started to wonder if I was living in the wrong city. 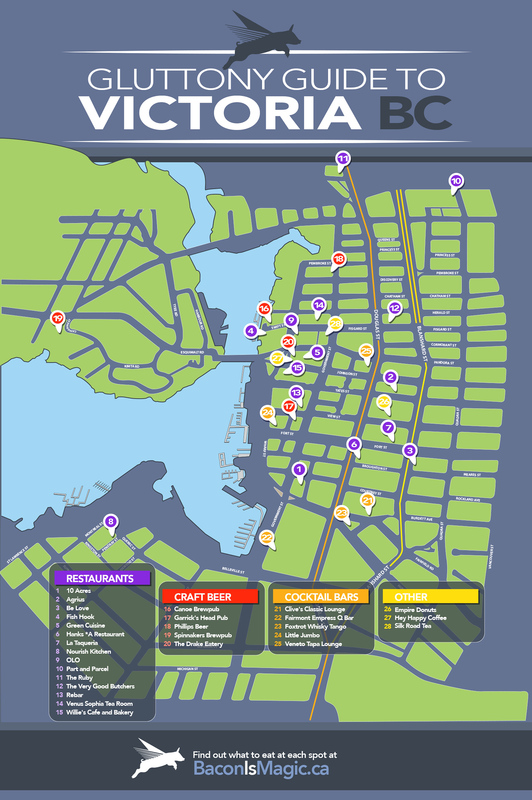 This guide to the best restaurants in Victoria BC is LOOOONNNNGGG. It’s because I visited an abnormal amount of restaurants, at each spot people recommended more places. I wanted to take in as much as I could. 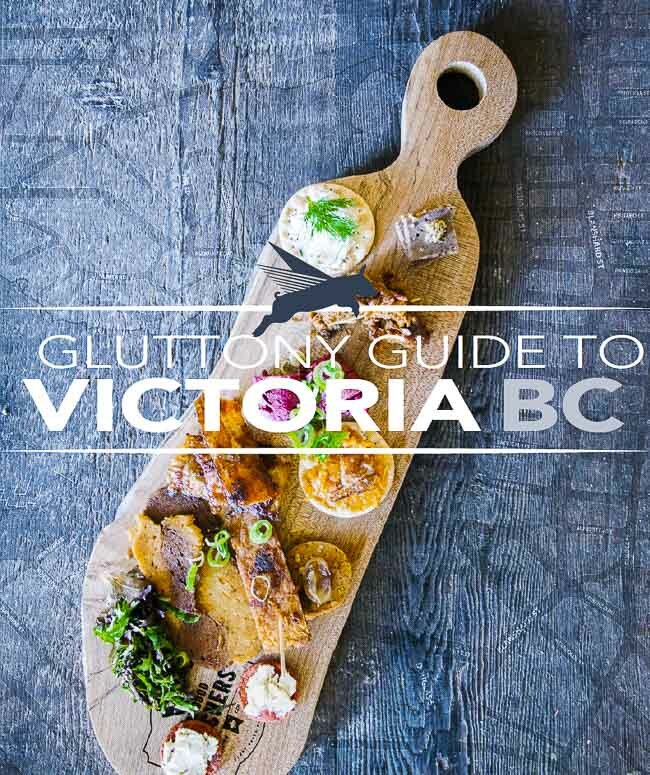 If you’re planning a trip to Victoria and want to know all about the best restaurants in Victoria BC along with the bars and shops download this FREE guide. It includes everything you need to know about this city. I could rave about this place all day and night. Nearly every local nodded when I told them I loved it there, it’s a quiet favourite amongst many. I LOVED the harissa carrots that were a new addition to the menu – so much so that I went back to eat them again and begged for the recipe (coming soon!). Not surprisingly Nourish caters to vegan, vegetarian and gluten-free diners, but also offers meat. This heritage home from 1889 is in James Bay and is the embodiment of conscious eating. With an emphasis on holistic nutrition the food focuses on enhancing nutrient density and bioavailability. Can I tell you how awesome Lisa Boylan is? She agreed to do this Facebook Live video with me where she teaches me how to shuck an oyster. She was terrified to do it but I think she did an amazing job. Also she’s training for a charity boxing match – and she’s never boxed before. She’s a beast. Originally from Ireland, she’s been at 10 Acres for a year. 10 Acres is actually 3 restaurants: 10 Acres Bistro, 10 Acres Kitchen, 10 Acres Commons. Fortunately they are all in the same block. What makes this place special is that it has its own organic farm. I love meeting people who love their job and are inspired every day. After our video Lisa talked to me about how fresh produce was and that she’d never worked anywhere with such a strong connection to the farm. 10 Acres Commons also has a great happy hour that is 10pm to close with 1/2 price raw and cooked oysters where Lisa and others shuck next to a DJ. Visiting Agrius reminded me so much of when I met Dave in Prince Edward Island. It was like walking into a restaurant he would have created if he opened one in Victoria. I knew he would have loved the design of Agrius. 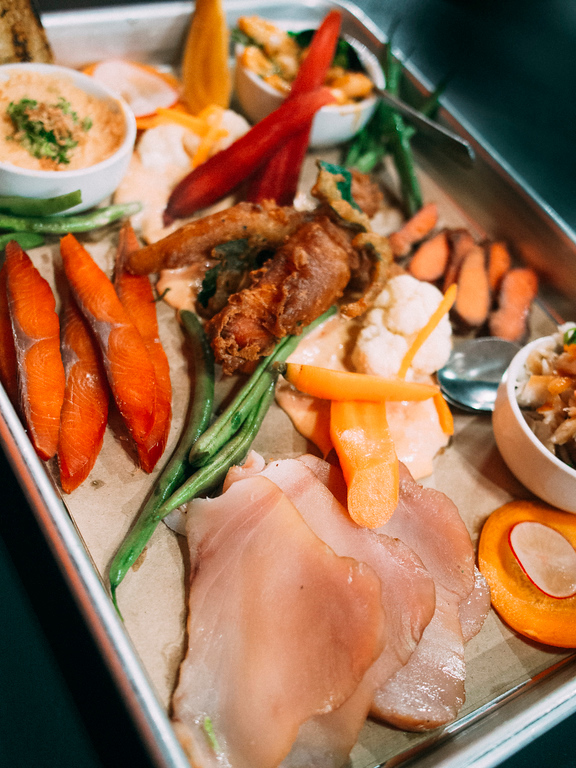 This restaurant makes all its own killer charcuterie in-house and has an in-house bakery (called Fol Epi) – the bread is SO good. I almost posted a photo of just the bread, which normally I skip in a meal, because you CANNOT skip it. It seems that others love it as well, it was named Enroute’s #4 best new restaurant in Canada. The front of Agrius is a cafe to get bread, pastries, cured meat and sandwiches. At night you enter through the side for the open kitchen restaurant. I recommend sitting at the bar for the best view of the kitchen. I managed to pop into Hank’s after dinner and just before the ended service. 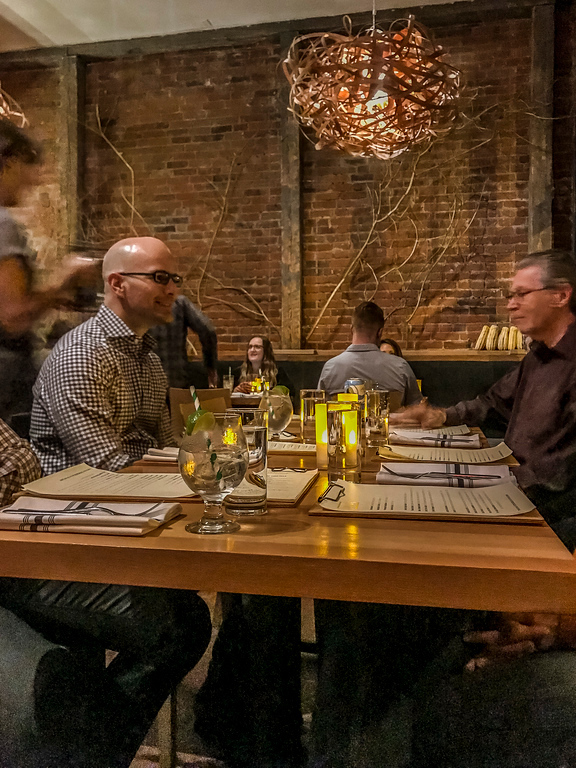 It feels like a Toronto restaurant, almost like the anti-thesis of west coast dining. It’s not light and airy and calm. It’s unapologetically small, dark, with Pearl Jam concert posters as artwork and music blasting. It’s a food first philosophy and I love everything about it. I immediately sent Dave a video of Hanks as I know to send he’s always wanted a restaurant like this. There are only two tables, one for 2 people and another for four. Otherwise it’s bar seating around an open kitchen cooking with induction burners. The menu is small, the food changes daily, and everything is made from scratch. Enough said. There’s no phone number, which is hilarious. You can’t book a reservation so there’s no reason to call. 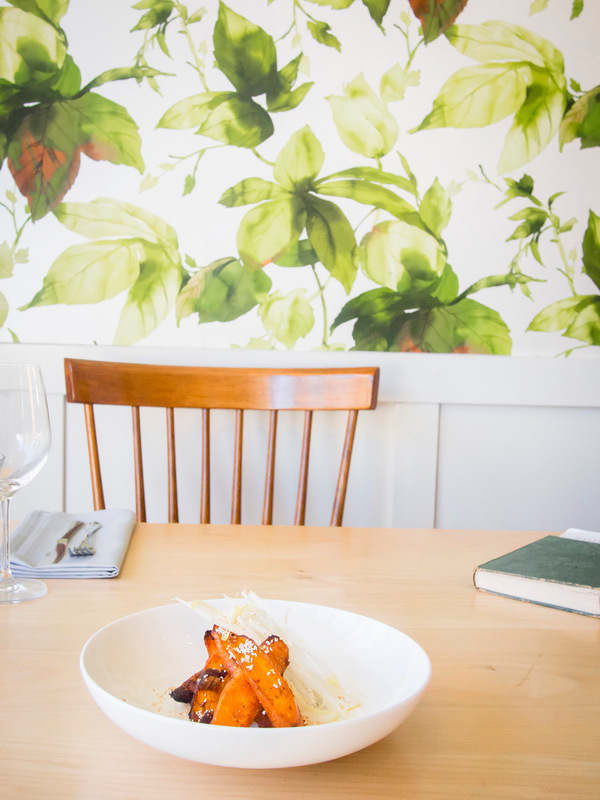 Although OLO is not new, it’s widely considered one of the best restaurants in Victoria BC. Locals love it and it’s easy to see why. The interior is stunning, the food is local and seasonal and the service is friendly without feeling insincere. And the cocktails are interesting, instead of wine I ordered the Bitter Booch with housemade kombucha with amaro. Farm to table at its heart. 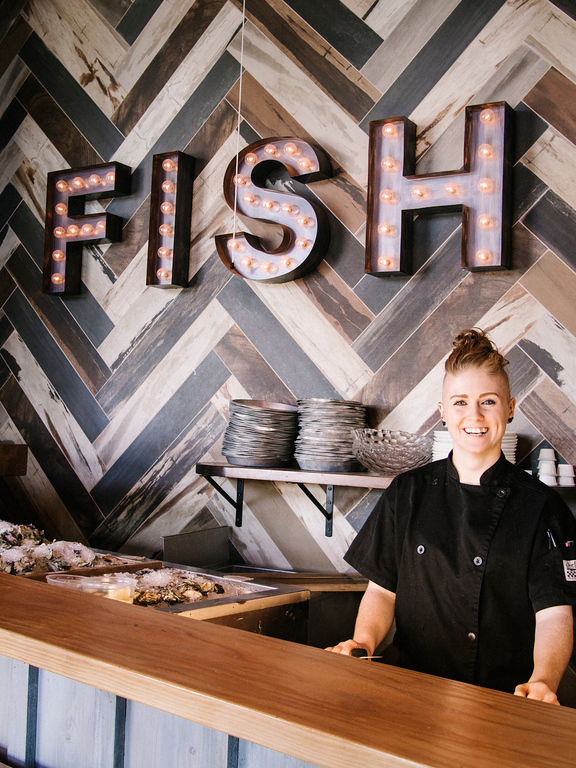 The name means “hungry” in chinook jargon and the restaurant uses classic techniques to share food that highlights the ingredients. It’s simple and delicious. I don’t do brunch. It’s just not my thing. I know cooks hate it because they partied too hard on Saturday night and are suffering Sunday morning. I don’t like waiting in line. Also, I don’t like paying other people for breakfast food. Friends don’t even ask me out for brunch anymore because they know the answer is no. I forgot that when I visited The Ruby on Saturday at noon, that technically was brunch. But they have a menu for brunch haters like me. I was skeptical when they told me the most popular item was the chicken and waffles, an item that seems to be on every menu in Canada right now. But I quickly put the sassy judgemental attitude to the side when I ate it. They aren’t just slapping KFC on Eggos with a side of Aunt Jemima. They use farm fresh chickens (never frozen) that they brine and then dry rub. The chicken was fantastic with the spicy maple syrup and the smoked tomato sauce on the side was TO. DIE. FOR. If I lived in Victoria I’d make an exception for brunch every once in a while if people were eating at The Ruby. 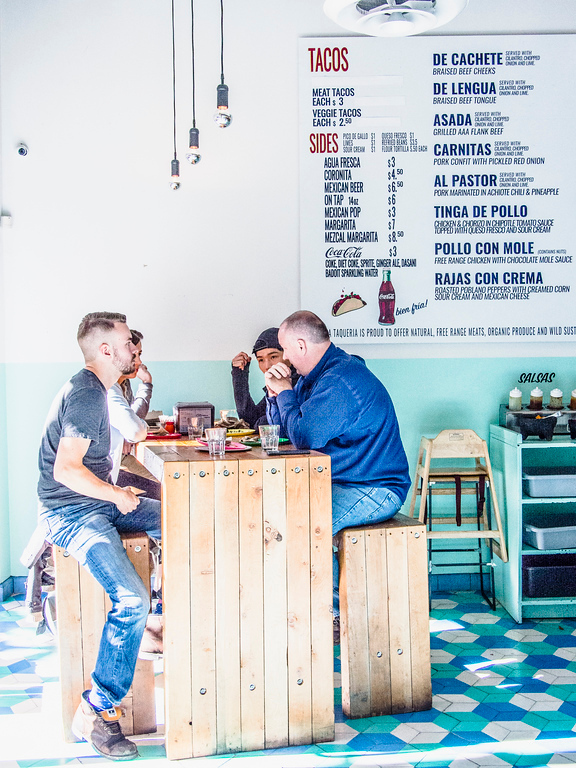 I don’t often seek out Mexican restaurants in other cities and was hesitant to visit La Taqueria but if you’ve been to a taqueria in Mexico you’ll sense the familiar aesthetic from signage to tiling. It’s not all for show, many of the staff are from Mexico and the flavours are legit. This isn’t the only location, they have four others in Vancouver. But don’t let this deter you. In Toronto we have a similarly well-known taco chain and they couldn’t be more opposite. At La Taqueria there is still a connection and respect to Mexico and they recently held a fundraising promotion for the victims of the Oaxacan earthquake. Kunal Ghose is most well known for opening Red Fish Blue Fish, the recycled shipping container fish shop which warrants long lines in Victoria’s Inner Harbour. He recently opened a second location for Fish Hook, on the waterfront at Mermaid Wharf opposite Canoe Brewpub which has a different menu. This one takes a seafood spin on Indian Thali, and while it’s not a round platter, it does offer a number of cured, smoked, fried and pickled seafood. This is a great dish to sit out on the waterfront with a drink. 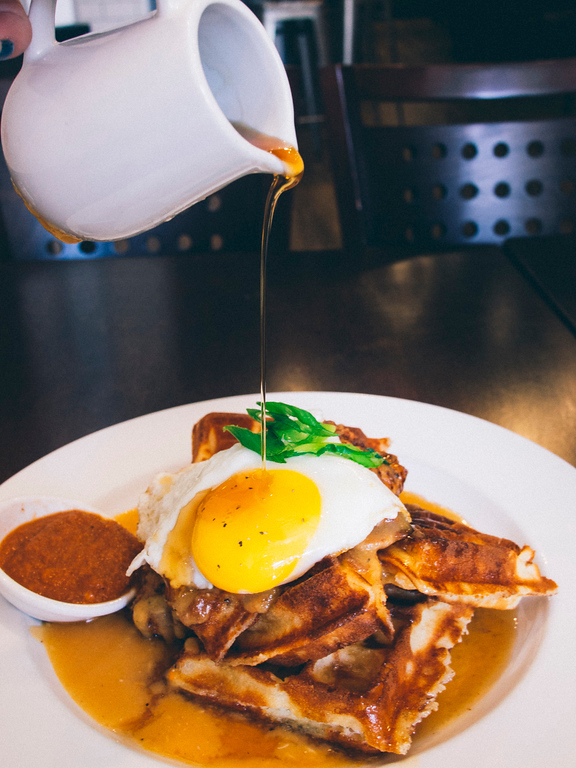 You cannot explore the best restaurants in Victoria BC without starting the day off right. Willie’s Cafe and Bakery is the oldest bakery in Victoria BC and also offers an extensive eggs benedict menu. 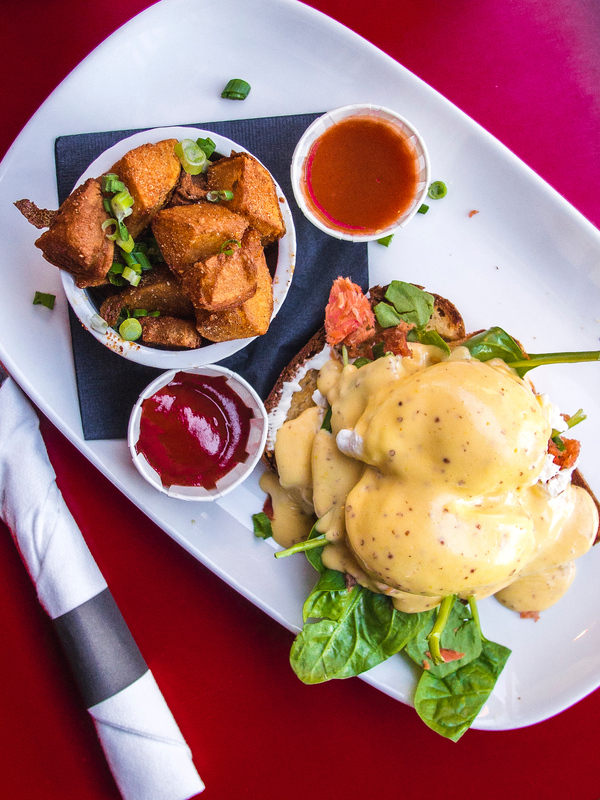 I chose the Tofino – in house smoked wild salmon, cream cheese, crispy capers, spinach and hollandaise. They use local, organic ingredients for their all-day breakfast and all-day lunch. Many people drive this route for the most picturesque Pacific Ocean views. If the weather is good you can follow this path around the southern coast of the city. It’s a popular spot for cyclists and joggers. There’s also an off leash dog park. This is an easy 2.4 km (1.5 mi.) paved path from the “Blue Bridge” by the Songhees totems through the harbour to the West Bay float homes. It’s all flat but if you want to burn extra calories run up the 100-step staircase. The most ambitious walk as the park is huge. It’s a short walk and there are some hills but also so much to see. Notably, Winston Churchill planted a tree here in 1929. On press trips a hotel will host you for free. 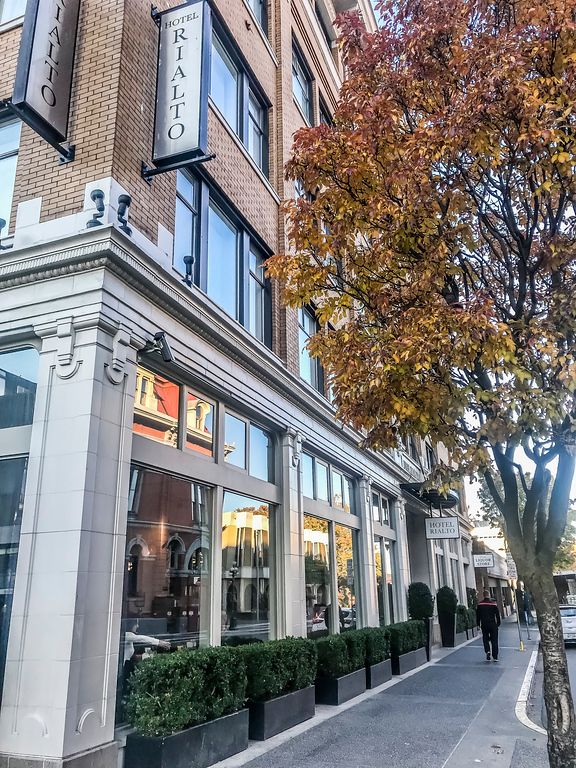 Hotel Rialto hosted me for 4 nights while on my search for the best restaurants in Victoria BC and I liked it so much I paid for two more nights on my own. Yet, I love smaller hotels and this is a new-ish (2009) hotel with only 52 rooms and it is close to everything. 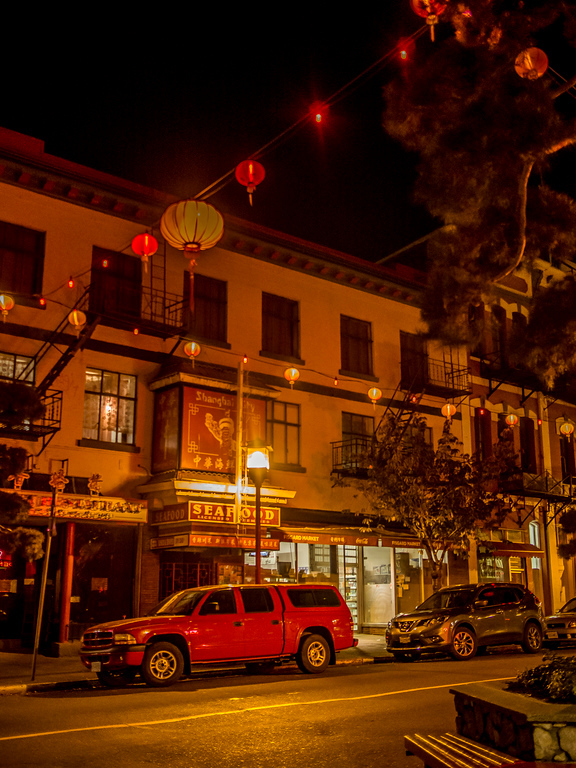 It’s a restored 1912 heritage building and the “Old World Italian with hints of Chinese influence” decor might seem a bit kooky but it pays respect to its original builder Chinese merchant Lim Bang. What I really love about this place is that they have a genius way to get people to opt out of maid service every day. If you choose to forego it, they give you a $10 credit to Veneto Tapa Lounge. So smart! I opted out the whole time. I’m tidy enough and can make my own bed. 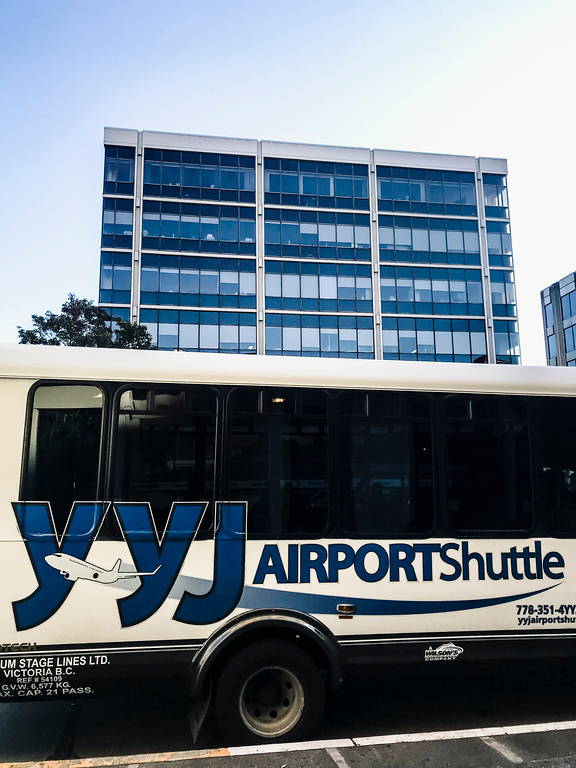 I flew into Victoria from Halifax – I was dreading the East Coast to West Coast travel day but it was surprisingly easy with a stopover in Edmonton. Also the V2V ferry started operating a daily round trip service from downtown Vancouver harbour to downtown Victoria harbour. It’s out of service right now but there are hopefully fixed soon. Also Clipper Vacations is launching a new passenger ferry service between downtown Vancouver and downtown Victoria. A 52-metre (170 feet) high speed catamaran that will carry 579 passengers and only take 3 hours from city to city. This is very good news as I mistakenly thought I could just take a quick ferry to Vancouver and was wrong. These options will change things considerably. In only one week I barely scratched the surface for best restaurants in Victoria BC. Yet, despite numerous recommendations I just couldn’t squeeze in Part and Parcel amongst other restaurants. I’d love to hear your recommendations in the comments below. Disclosure: This post about the best restaurants in Victoria BC was in partnership with Tourism Victoria. I approached them to work together a few months ago because I heard the city was beautiful but I had no idea how much I’d love it. And thanks to Katie for taking my photo at 10 Acres, I never take photos of myself and I love this one. « Best Vegetarian Restaurants in Victoria – and Vegan too! I need to visit Victoria just for the food. 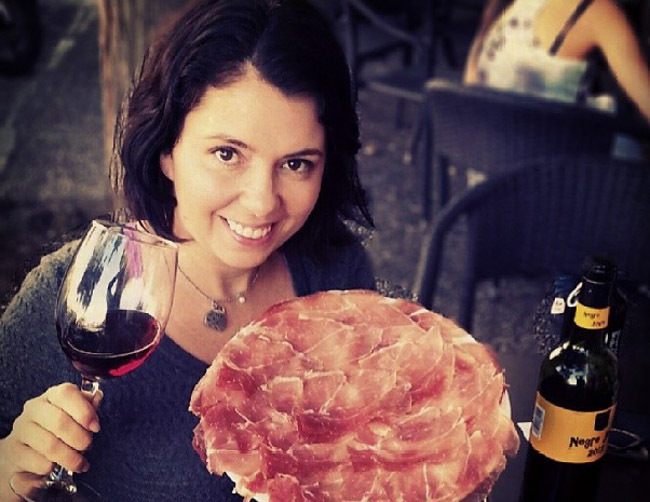 These stops along the culinary trail are awesome. It’s going on the bucket list. Victoria has been on my bucket list for a LONG time and now that you’ve shown me where to eat, I really have no excuses. I can’t wait! I love Victoria! I never knew there were so many different options for cuisine. Thanks for this tour! If I ever get to visit this corner of the world I will make sure to visit Victoria. The food places and food dish pictures in your post really sound great! How fun! Your great roundup of restaurants makes me want to pop in the car and drive up to Victoria!!! I have sent your post to my friend that lives near there! Great post and read! Wow! some amazing dishes and the restaurants on the list. Really helpful. Thanks for sharing. Amazing! very helpful for me since I would be heading Portugal by early next year. Thanks! a ton. That sounds like an amazing city! I would have a hard time deciding which of these restaurants to visit first! I loved this post! We went to Victoria (and Vancouver) on our honeymoon, and Victoria won our hearts for sure. Such a charming city full of good eats! Thanks for sharing these dining options in Victoria! So many wonderful places to eat! Loved your gorgeous pictures too! You definitely should, from what I hear things are changing. This makes me want to plan a trip right this second. What an awesome city! I’m already planning my trip back this spring. Just WOW! I’ve never been to Victoria but you’ve got me sold. It’s a hard life being a food blogger isn’t it – visitng all of those restaurants must have been exhausting! Life is rough! Great weather and food, with nice people. It’s hard to complain. I haven’t been back to Victoria for many years and you’ve made me long to go back. Healthy and half the rainfall of Vancouver? Loads of restaurants. That’s me sold! I always thought all of the west coast was rainy but when I heard Victoria didn’t have the same amount I started to think I should move there. Victoria seems the Mecca for all the food lovers. I am definitely going to add this place to my bucket list. Victoria is great! I’m so lucky my sister lives there! Consider visiting Sült Perogi Bar and The Tapa Bar restaurant. I have never been to Victoria, but I think I need to make a trip! All the restaurants looked like they had delicious food, and the vibe of the places looked fabulous! I can’t wait to add this to my list of places to visit. Thanks for the inspiration. Omg! So much seafood! I’m a little ashamed to say that I’ve been all over the US, to Mexico, to the Caribbean, and both Eastern and Western Europe.. but somehow I’ve missed our friendly neighbors to the north. When I make it there, I’ll have to come to Victoria- because seafood was not my first thought when I thought of Canada!! I feel like I’ve traveled quite a bit but I haven’t made it to Victoria BC yet! This is a great resource for when I go though! I definitely want to check out one of the 10 acres restaurants – yum! This is a perfect place for a travel food lover like me, this definitely becomes part of my itinerary when I travel to Canada soon. Ah! Why didn’t you mention Brasserie L’ecole? I lived in Victoria for nearly 30 years and anyone who is a true local knows this is hands-down #1 in the city. Please, add to top of list! Sean and Mark deserve a huge shout-out for all of the hard work they’ve done over the years. No one recommended it to me who lives in Victoria and I didn’t see it mentioned in any of my research. The next time I visit I will definitely check it out. What do you recommend ordering?